In this article, I will address a few popular questions and answers for individuals who are applying for permanent residency through Canada’s Spousal Sponsorship program. If a foreign national is married to a Canadian citizen or a permanent resident of Canada, they may be able to apply under the Spousal Sponsorship program of Canada. Spousal Sponsorship was intended for these foreign nationals to obtain permanent residency faster and reunite with their spouses. In order to discover more information about Spousal Sponsorship, please continue reading this article. Essentially, the intention of this FAQs Spousal Sponsorship article is meant to clarify any questions or information you would like to know with regards to Spousal Sponsorship. Q: What are the recent changes to the Spousal Sponsorship program? A: This is very important to recognize especially if you are applying for a Spousal Sponsorship soon. The Canadian government has made changes to reduce the processing times for the inland spousal sponsorship as well as the overseas spousal sponsorship. They are both estimated to be processed within 12 months (1 year). Additionally, now there is only one application package for both inland and overseas spousal sponsorship applicants. Other changes include not having to submit a medical exam or a police certificate from the beginning of the application process. If Immigration requires this information from you, they will inform you accordingly. Q: Will I be affected by these recent changes to the Spousal Sponsorship program? A: This entirely depends on when you have submitted the spousal sponsorship application. If you apply after January 31, 2017, you must use the new application package. Please note if you are submitting your application after this date using the old package, Immigration will not accept it and will return it to you. Additionally, if you applied between December 15, 2016 and January 31, 2017, you can apply using either the old or new package. Conclusively, if you applied before December 15, 2016, you will not be affected by the recent changes to the Spousal Sponsorship program. 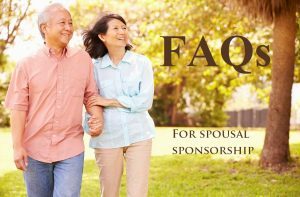 Q: How old does my spouse have to be in order for me to sponsor them? A: Since June 10, 2015, the Canadian government refuses any spousal sponsorship applications for spouses that are under the age of 18. Therefore, all spouses being sponsored to Canada must be at least 18 years old. Q: What does current or previous undertaking mean on a spousal sponsorship application? A: On a spousal sponsorship application, a current undertaking means the spousal sponsorship application that you are currently in the process of submitting. On the other hand, a previous undertaking is a spousal sponsorship that you are or were involved in. This can be the case whether you were the sponsor or the co-signer of a spousal sponsorship application. The sponsored applicant of that undertaking must have obtained permanent residency in Canada as a result of the spousal sponsorship application. Keep in mind, any spousal sponsorships that were refused are not considered to be previous undertakings. Q: What is the process if I would like to withdraw my application for spousal sponsorship? A: In order to withdraw your spousal sponsorship, you must fill out a Web form on the Citizenship and Immigration Canada (CIC) website. On this form, you should include your personal information, such as your name; date of birth; contact information; the date the application was submitted; your client ID number, if you have one; indicate that you submitted a spousal sponsorship application; and, ultimately, why you would like to withdraw the application. Subsequently, you should also attach a copy of your payment receipt. Please note, if your application has been processed and the sponsored spouse obtains permanent residency before you withdraw the application, unfortunately, Immigration will not cancel the application. Thus, you will have to abide by the requirements of the sponsorship. Q: How do I know if Immigration has received my spousal sponsorship application? A: Fortunately, Canadian Immigration will notify you the moment they begin to process your spousal sponsorship application. They usually send an acknowledgement of receipt letter or send an e-mail that includes the application number. Please note that Canadian Immigration does not send any acknowledgement when they receive the application. This is because they only send the acknowledgement once the application has been opened and they have reviewed it to see that it is complete. Additionally, the day that they receive the application will be different from the day that they open the application; therefore, they only send one letter or communication. Q: What factors will affect whether my application is returned to me? A: Usually spousal sponsorship applications are returned to the sponsor and the applicant if the application is incomplete. For instance, if there are missing documents or missing information on the forms, Immigration will return the application to you. In addition, if the government fees are not paid or are missing from the spousal sponsorship application, Immigration will return the application. Also, if the forms that are filled out are outdated and the new updated forms are not submitted with the spousal sponsorship application, Immigration may return the application.